I saw a notice that there was going to be Jazz in the Park, in downtown Plymouth. I have written about Plymouth quite a bit, as it is a cute community with a very nice downtown area with a big park right in the center. There seems to be something going on most weekends in the city and it is a wonderful place to walk around, get some exercise and a dinner and some wine. The Jazz in the Park, must be relatively new as they seemed to be not as organized and polished as some of the other events, but there is a learning curve for all events, and I can appreciated the growing pains. We saw a couple of performances and then we continued walking around during a change in groups. As we were walking around the park listening to the music, we noticed that there were quite a few people that had pizza boxes opened while they were there. All of sudden I felt like having a pizza, but I did not want to sit in a park and have one, so we decided to walk around and find a venue for dinner, which that night meant a pizza. We ended up at Nico & Valle, which is a quaint Tuscan appearing structure just off the downtown ring that we had been before, but the last time we were there, they were in the midst of renovating the interior and there was wide expanses of plastic sheeting to cut down on the construction dust. We walked in and the construction was completed and there was not a bar and definitely more dining area, since the last time we were there. We ordered our pizza with all sorts of different toppings and just relaxed and enjoyed some wine as well. Since we were in an Italian eatery, we chose some Italian wines to enjoy while we were there and both were from the Veneto area, which is the north-eastern corner of Italy and the largest wine production area of Italy. 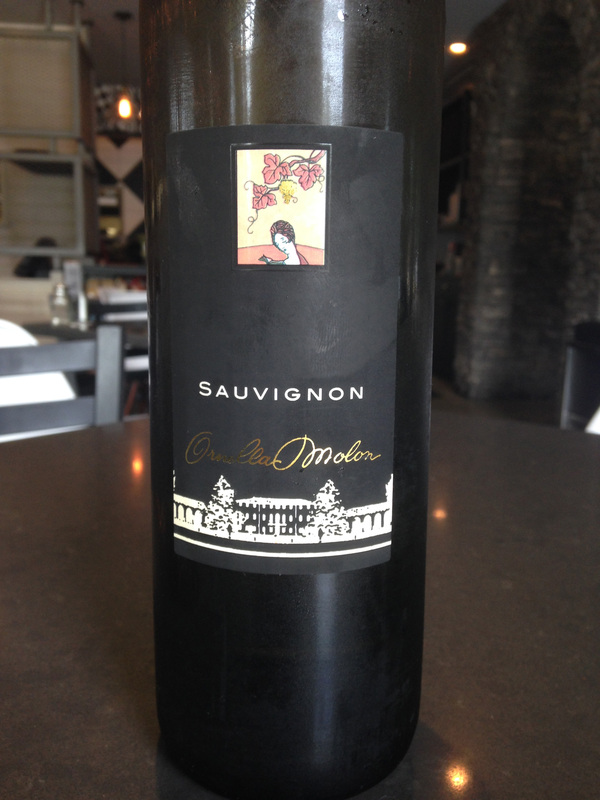 We started off with Ornella Molon “Bianchi Selezione” Sauvignon IGT 2012. This was a crisp white wine, but Sauvignon Blanc is not one of the stars of Veneto, and hence the IGT designation and I was surprised that the label only read Sauvignon without the “Blanc.” It was a great way to cool off from the summer heat and prepared us for our dinner. 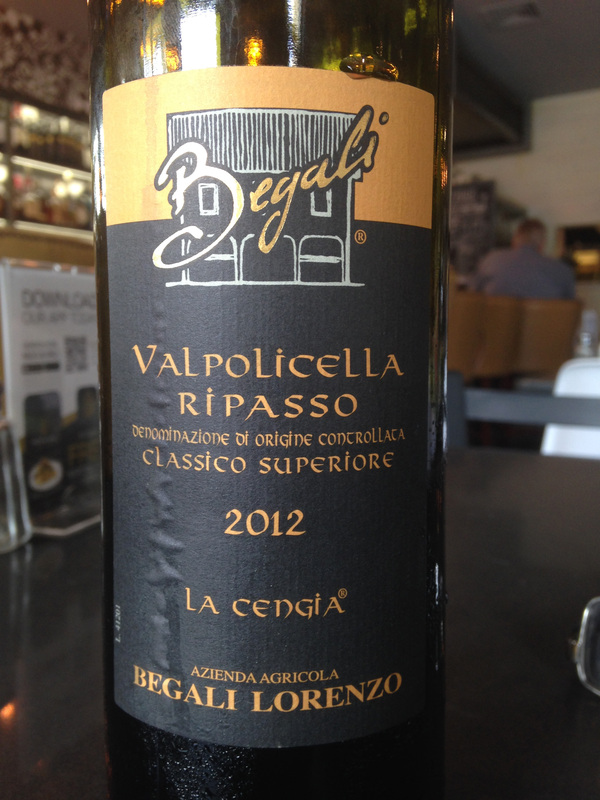 The wine we chose for our dinner was Bengali Lorenzo La Cengia Valpolicella Classico Superiore Ripasso 2012. I grant you that is quite a mouthful, but to make some sense of it, one can break it down by sections. Valpolicella Classico Superiore means that the grapes come from the original area for Valpolicella when they received their DOC in 1968, because there is also a Valpolicella DOC which encompasses more land then the original demarcated area. Valpolicella is made basically from the three stars of the area Corvina, Rondinella and Molinara. These three varietals also are found in Amarone wines from the same area. The Ripasso DOC designation means that the vintners actually reuse the fermented skins of Amarone grapes and add then to a second fermentation for the Ripasso method, which allows more Tannins and a fuller tasted to the wine. In the pecking order the Valpolicella is the lightest of the group, the Classico has more body and the classic terroir that the wine is noted for, and the Ripasso is the fullest bodied and more nuanced of the three designations. It was just a great way to spend the evening. This entry was posted in Dining, Wine and tagged Bengali Lorenzo, Corvina, Italy, La Cengia, Molinara, Ornella Molon, Rondinella, Sauvignon Blanc, Valpolicella Classico Superiore Ripasso, Veneto. Bookmark the permalink.